Really excited about today's game. We'll go top if we win, which will be the first time we've been top of the league since March. It's a massive game. You can throw the form book out of the window on this one. We've won five of our last six games but we can't take anything for granted. This lunchtime we need our players to be focused on the tasks at hand. Which is beating the boys from the lane playing some superb attacking football and not worrying about off the pitch issues. Which is why I urge Samir Nasri to shake the hand of Willam Gallas. The Sun among others say that the young Frenchman is planning a Wayne Bridge style snub on Gallas when they go through the performance of shaking the oppositions hands prior to kick off. All I can say is don't. Let your football do the talking on the pitch. We know you don't like Gallas but at the end of the day no Gooner is going to think you hypocritical for shaking his hand. It is just a sideshow which we don't need any attention brought on. We need to concentrate on the most important matter of today, beating Spurs and going top of the league. And on the subject of Gallas, if you're going to the game, don't do Gallas the honour of booing him. He's really not worth it. He's now at a lesser club, cluttering their wage bill. And we don't need him nor are we missing his presence in our defence. So don't let him bother you. Arsene Wenger has been bigging up our French play maker. He's been my stand out player this season for us. I have been really impressed by his attitude and performances. He's stepped on to another level, which I'm very pleased to say I didn't see coming. I always thought he was a good player, but this season seems to have taken a huge leap forward. "Not going to the World Cup was certainly a big shock for him but he is mentally strong. With his back to the wall he can respond. Don't forget France didn't take Benzema either. "He is more efficient in what he's doing. He has all the needed individual talent. His finishing is better, his final ball is better. I'm convinced that overall he makes steps forward. "He has developed as a footballer and as a person. He grew up at Marseilles and then he left for England that matures you." 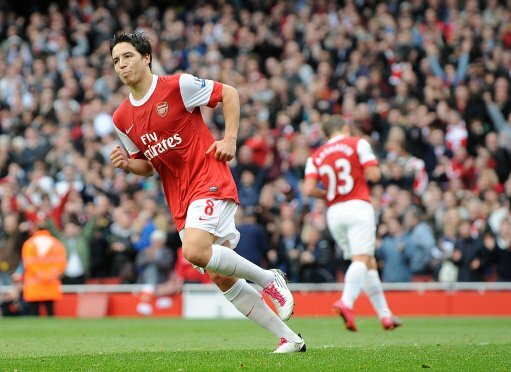 I think there is a lot more to come from Nasri. I'm convinced he'll be a star at the Grove for many years to come. I love his attitude, commitment and his desire to win. And of course popping up with a few goals against your fiercest rivals would certainly go down well today. On man who looks not to be included in Arsene Wenger's squad for the game later is Nicklas Bendtner. The manager has decided he wants the Dane to be fit for the Champions League trip to Braga on Tuesday night, so won't even be on the bench for this afternoon's game. "I believe that he will not be involved on Saturday but he will play on Tuesday in Braga certainly. "I rotate the squad and I decide sometimes the players I want to get into the squad for the next game, it's better that they practice rather than sitting on the bench doing nothing especially when they're coming back from injuries." I personally don't think Wenger is banning him from the team like some would lead you to believe. The manager is certainly not pleased with what the big Dane had to say, but the Frenchman isn't stupid enough to put his personal pride ahead of putting obstacles in the way of the team getting a win. If he really felt we needed Bendtner, I'm sure he'd find a way to accommodate him on the bench. But frankly there are a lot of attacking players who might be forced to fight their way into the team and Bendtner is one of them. One player who's slowly started to impress since the start of the season is Johan Djourou. He's come back from injury at the end of last season, didn't go to the World Cup and has had to fight off the new competition in the central defence to gain a place in the team. I think quite a lot of people expected the tall Swiss man to be fourth choice if we had everyone fit. But since he's been in the side this season we have only lost one game out of the nine he's started in. He's slowly improving in a way you can only do with playing regular football. And he's had to take his chance with the absence of Thomas Vermaelen and the suspended Laurent Koscielny. And now it seems he wants to repay the club's faith in him. "At another club, like Manchester City, it is true that I could have been out for a year and never have got back into the team. I would have been replaced. "When you come back and you are given a chance again at Arsenal, you are so grateful because it could be different, totally different somewhere else. Arsenal believed in me and that's such a big boost. You are never forgotten here." It will be interesting to see whether Koscielny comes back into the side this afternoon. I'll give you my thoughts on my match preview blog later. Elsewhere, the Daily Mirror report we're trying to sign Japanese teenage midfielder Ryo Miyaichi. The 17-year-old needs a work permit, which Arsenal have to apply to the home office for. If successful, the teenager will join us. And finally some Saturday morning reading for you, courtesy of The Guardian. They ask can we win the league? My reply, of course we can.